Blaine Harden has served as The Washington Post’s bureau chief in Northeast Asia, Eastern Europe, and Africa. He was a national correspondent for The New York Times and has contributed to The Economist, PBS Frontline, Time, and Foreign Policy. He is the author of The Great Leader and the Fighter Pilot; Escape From Camp 14, an international bestseller that has been published in 28 languages; A River Lost; and Africa: Dispatches from a Fragile Continent, which won a Pen American Center citation for a first book of non-fiction. "A good yarn and a timely one — appearing as Americans are once again pondering the possibility of war with North Korea." "Harden’s Nichols is both a victim and an exemplar of a war that 'most Americans never debated, let alone understood.'" "An engrossing hidden history of wartime espionage, with elements of derring-do and moral barbarity. . . . [Harden] ably connects his ominous central figure to the larger mysterious, unresolved narrative of the Korean conflict....Fascinating." 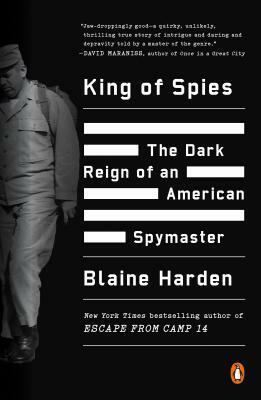 "Blaine Harden has done more than anyone else to bring [North Korea] to a mass audience. . . . Thrilling stuff." "A riveting book that makes the history of North Korea accessible to the general reader." "An eminently readable picture of our most under-remembered war." "Harden's book, besides being a gripping story, unsparingly told, carries a freight of intelligence about this black hole of a country." "A riveting new biography . . . If you want a singular perspective on what goes on inside the rogue regime, then you must read [this] story."